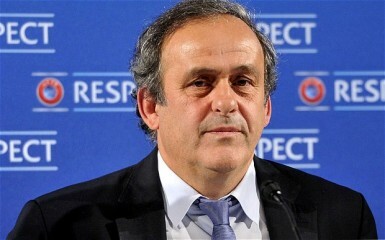 PARIS, (Reuters) – Suspended European soccer chief Michel Platini will not attend tomorrows FIFA ethics committee hearing in protest at what he condemns as a political process designed to prevent him running to lead the world governing body, his lawyers said yesterday. Platini was provisionally suspended for 90 days on Oct. 8, alongside outgoing FIFA president Sepp Blatter, over a suspicious payment from FIFA to Platini, deepening a corruption scandal that has engulfed soccer’s ruling body. The ethics panel is set to rule on their cases, and could impose much longer bans than the provisional suspensions if it finds the men guilty of violations. Blatter is due to appear today. Both men have denied any wrongdoing. Platini’s lawyers objected to comments in French newspaper L’Equipe by ethics committee spokesman Andreas Bantel that the former France captain would be sidelined for “several years”. “Michel Platini … has decided not to attend his hearing at the FIFA ethics committee on Dec. 18, 2015, as the verdict of this ethics committee has been announced in the press last weekend by one of its spokespersons, Mr Andreas Bantel, in disregard of all fundamental rights, starting with the presumption of innocence,” the lawyers said in a statement. By his decision to boycott the hearing Platini “intends to show his deepest indignation towards a process which he considers as uniquely political and designed to prevent him from putting himself forward for the FIFA presidency,” the lawyers said in their statement. FIFA said they noted Platini’s decision but his lawyers were still welcome to attend the hearing, which would be handled in “an unbiased manner”. “Mr Platini would miss the opportunity to present his points of view vis-a-vis the adjudicatory chamber in person,” FIFA’s ethics committee said in a statement. Platini, who has been head of European soccer’s governing body UEFA since 2002, had registered as a candidate to replace Blatter in a vote on Feb. 26. He had been seen as a frontrunner for the job before he was suspended as part of an investigation into the payment of 2 million Swiss francs ($2 million) he received from FIFA in 2011 for work he completed between 1998 and 2002. Last Friday, he failed in an appeal to the Court of Arbitration for Sport (CAS) to have the suspension lifted, meaning he was unable to attend Saturday’s draw for the Euro 2016 Championship in France. FIFA is suffering the worst corruption scandal in its more than 100 years of existence, drawing in top officials and triggering investigations by U.S. and Swiss authorities.